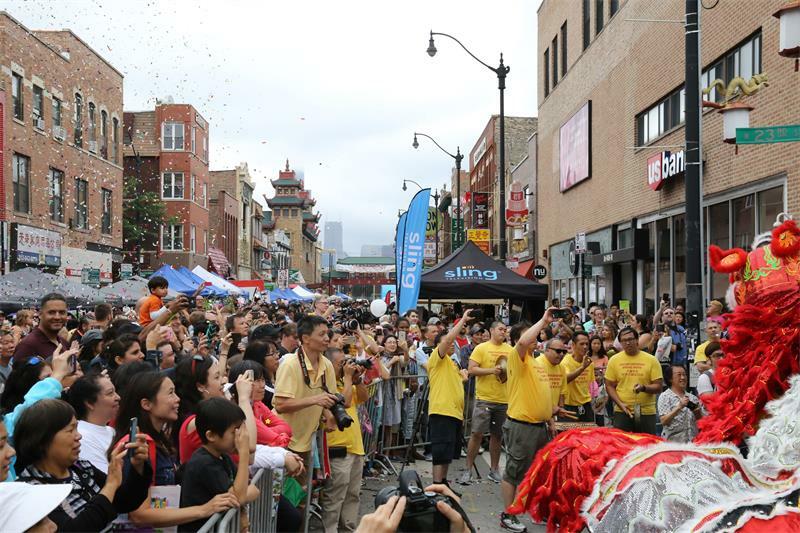 On July 18, Acting Consul General Liu Jun attended the Opening Ceremony of 2017 Chinatown Summer Fair held by Chicago Chinatown Foundation and Chicago Chinatown Special Events Committee. Illinois Governor Bruce Rauner, Illinois State Representative Theresa Mah, Alderman of Chicago’s 25th Ward Danny Solis, Alderman of Chicago’s 11th Ward Patrick Thomspon as well as the leaders of the community attended the event. Acting Consul General Liu Jun delivered a speech at the Opening Ceremony. He said that Chinatown’s Summer Fair, which has been held for 38 years with increasing scale, has become more and more popular among the American public. Today tens of thousands of people gathered here to celebrate an unforgettable summer holiday. Liu Jun expressed his appreciation for the hard work of the event organizers and also thanked the sponsors for their strong support. 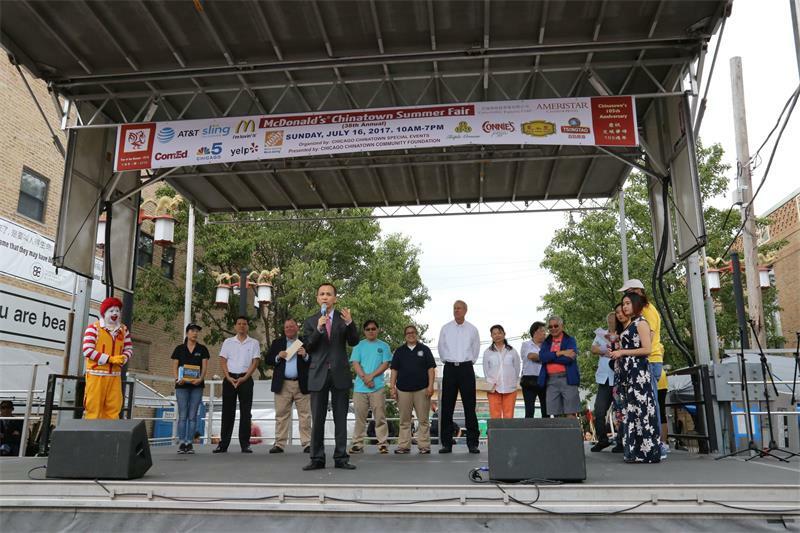 He said that Summer Fair is not only promoting the Chinese culture and showcasing the strength of unity of the Chinese community, but also bringing more businesses opportunities to Chinatown. 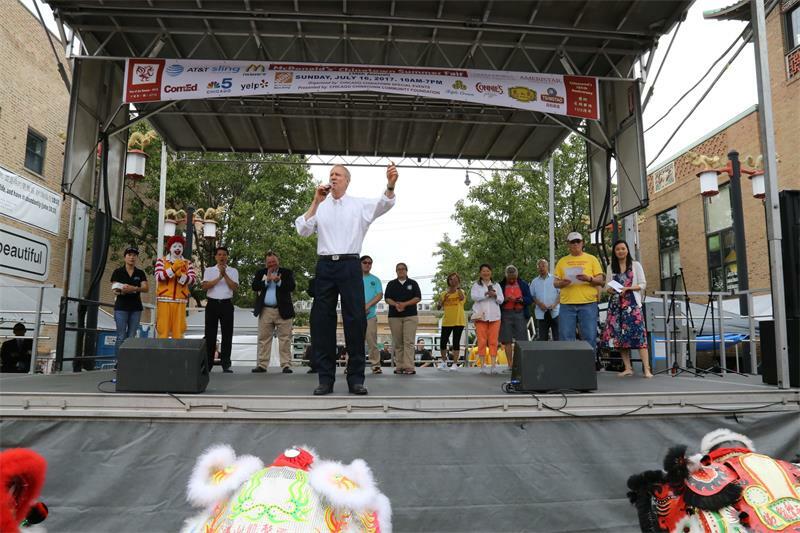 Illinois Governor Bruce Rauner said that Chicago Chinatown is the most thriving and booming Chinatown in the United Sates. Chicago Chinese Community is an outstanding example of immigrant community. All immigrants from China are welcome to join the American family to pursue opportunities for development together. The Summer Fair started at 10 am. Thousands of people gathered in Wentworth Avenue of Chinatown and made it quite a scene . Various Handcrafts, household items and other goods were waiting for sell. Delicious Chinese food and children’s recreational activities brought lots of pleasures. Splendid Chinese martial arts, dragon dance performances and other exciting programs presented audiences with one after another amazing shows and brought a joyful festival to Chinatown. Consul Lu Xiaohui and consul Cen Jiande of Oversea Chinese section of the Consulate also attended the event.